It is 5pm in the afternoon and a day-old loaf of super yummy whole grain crusty loaf is calling my name. French Toast! 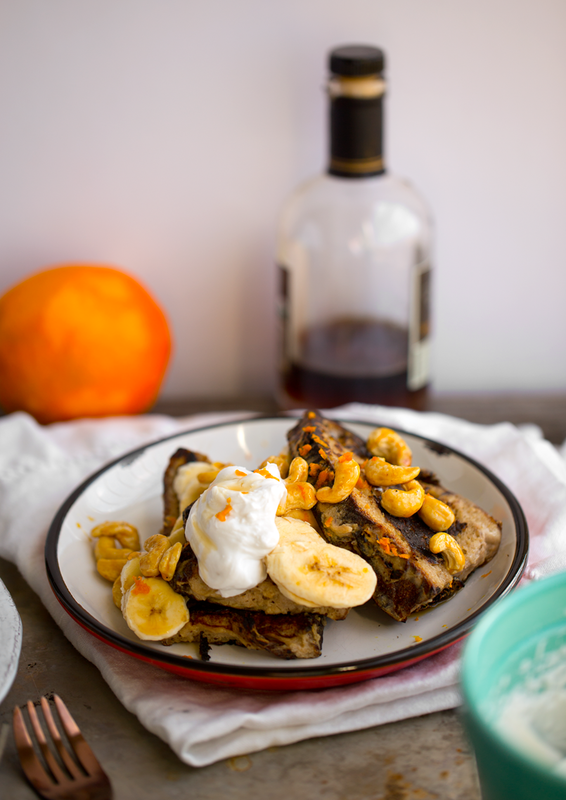 I don't know why, but I had been dreaming of this creation all day and of course, 5pm seemed like the perfect time to whip it up, photoshoot it and get it ready for posting before the weekend so you guys can try it for brunch! 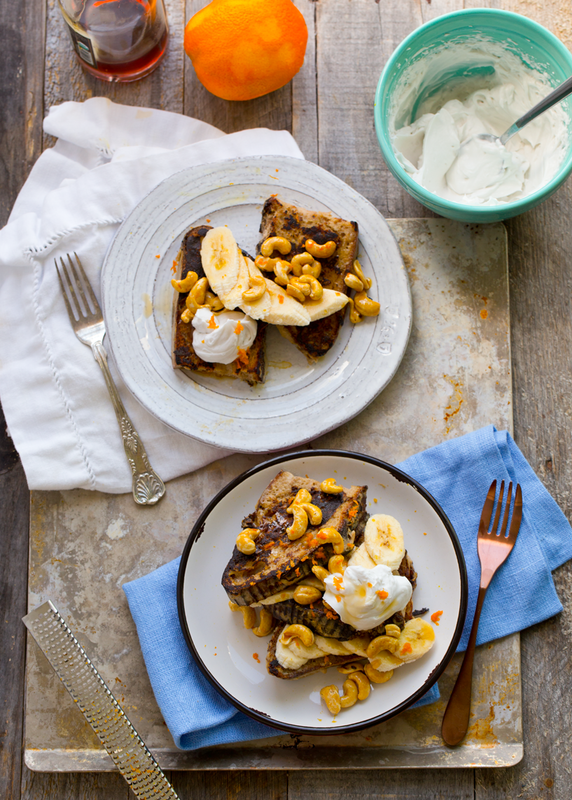 This Banana Bread French Toast with Coconut Whip and Cashews is super dreamy. It takes very simple (easy!) 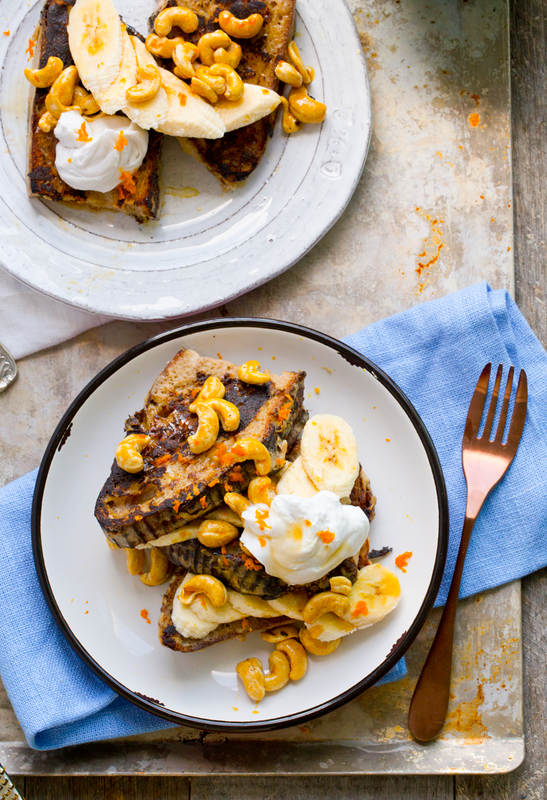 banana french toast and turns it into something that looks restaurant-ready. If I ever open my own little cafe, this dish is definitely going on the menu! 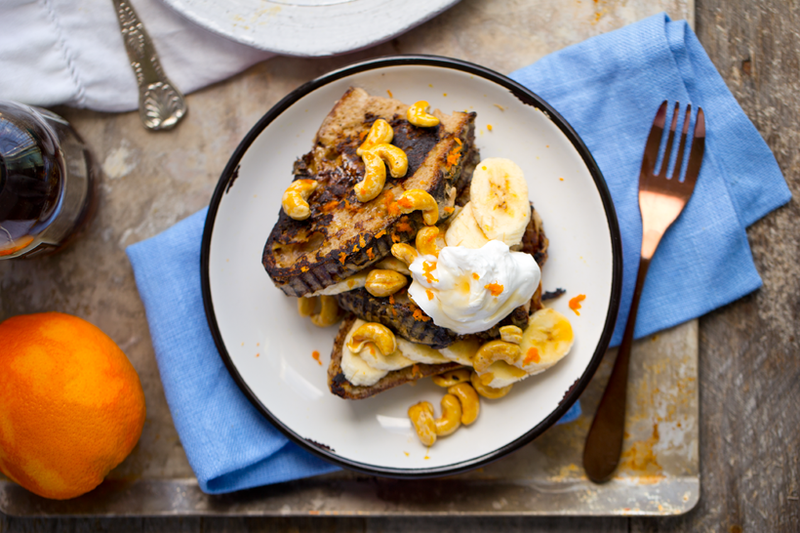 The secret (or, not so secret, trick..) to reallllllllly good french toast is all about the bread. I found this awesome loaf at the farmer's market, from Lodge Bread here in Los Angeles. It was an ancient grain loaf, all crusty and amazing. We bought it on Sunday and had it sitting on the counter for a few days and come Wednesday, it was perfect for french toast. Day-old crusty bread is perfect for this recipe. The ancient whole grain wheat loaf made for a hearty bite in my french toast. If you go with a more refined grain like sourdough, your slices will be more tender and moist. But I really loved this texture! Perfectly moist, yet also sturdy enough to pile on bananas and coconut whip. - coconut whip ...how-to video in this post. And boom. Your perfect brunch meal is ready. Just add your fave latte, matcha or espresso or turmeric work, and enjoy! This would also pair really well with a freshly squeezed glass of orange or grapefruit juice. Gluten-Free Bread Option? Yes. If you need to stick to gf bread, you can absolutely still make this recipe. Just modify the soaking time as needed. 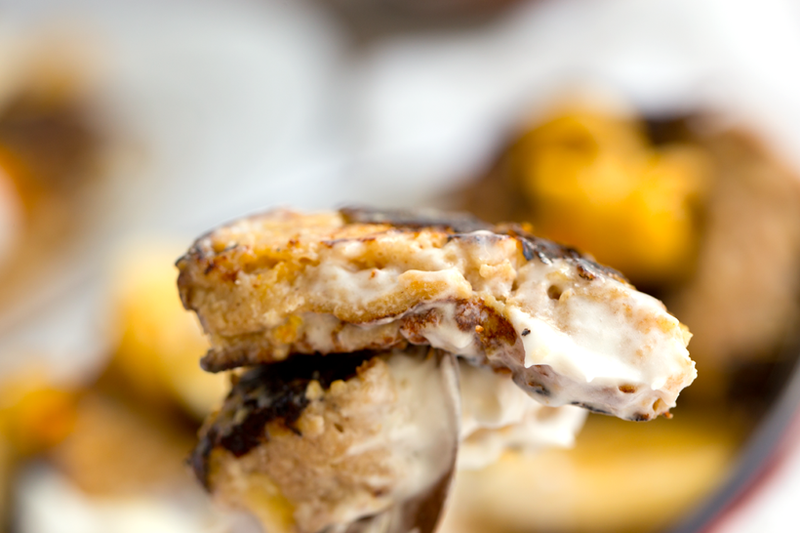 You do not want to over-soak and come away with soggy french toast. But if you under-soak, the french toast will be on the dry side. You can a fully-marinated piece of bread, that still holds up when lifting out of the liquid. If the bread is falling apart after soaking, you have over-soaked. And some gluten-free bread might be more delicate. Happy brunching everyone! Get more of my vegan brunch recipes here. PS. I have a little side ramble all about "healthy" "happy" food choices, vegan eating and more, below the recipe. 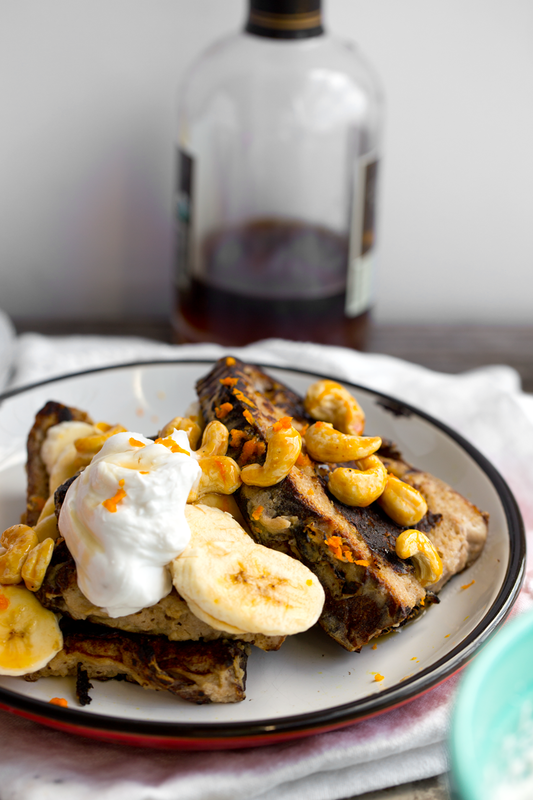 This super easy vegan french toast is booming with cravable flavors. 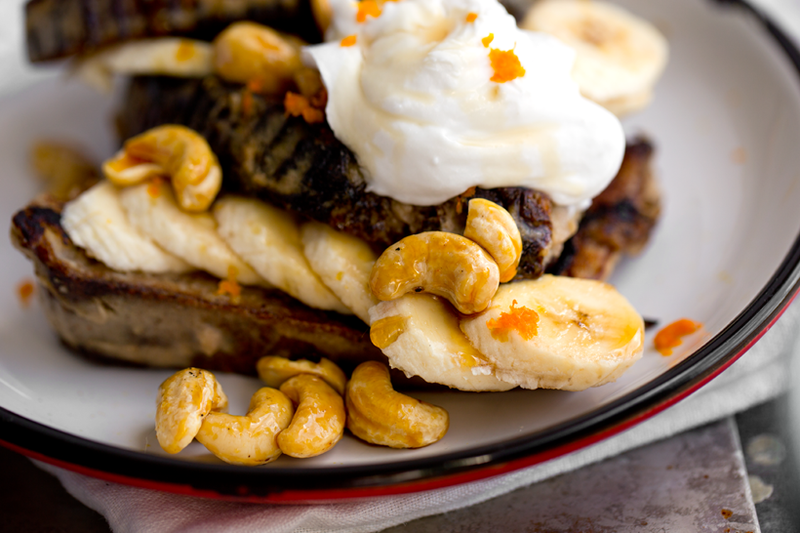 Banana, cashew, citrus zest, cinnamon, candied cashews and coconut whip on top. Add to a blender: bananas, non-dairy milk, cinnamon, cashews and salt. Blend until smooth. Pour into a shallow bowl or baking dish. Place the bread slices in the wet mix. Press down with a fork to allow the bread to absorb all the liquid. Soak for about a minute. Flip the bread and soak another thirty seconds or so. Warm a skillet over medium heat. Use a non-stick skillet or grease well with EVOO or coconut oil. When the skillet is hot you can add the first 2-3 soaked slices of bread. 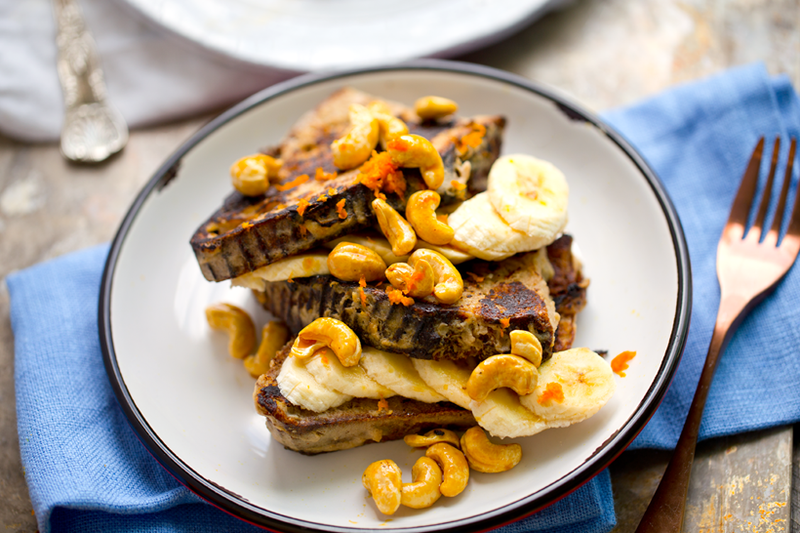 On the serving plates, layer the french toast with slices banana. Cashews: Add the cashews and agave, coconut or maple syrup to the pan, keep the skillet at medium heat and shake the pan a bit. 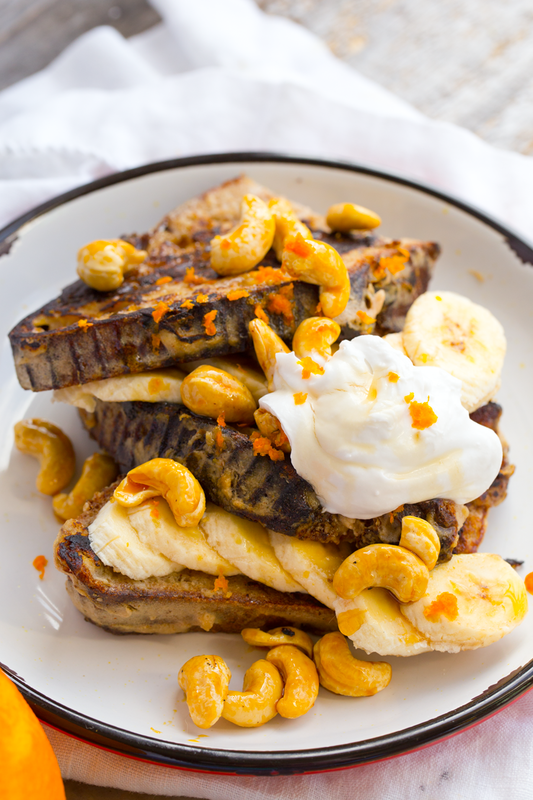 Toast the cashews with the syrup for a minute. Remove from heat and pour over top the french toast on the plates. As the cashews cool they will candy a bit. Zest an orange over top the plates. And finally, whip up (literally) the coconut whip. Open the chilled can and scoop the hard white part (the coconut cream) into a deep and small bowl - medium in size. Also add the powdered sugar. Beat until fluffy using a hand mixer. 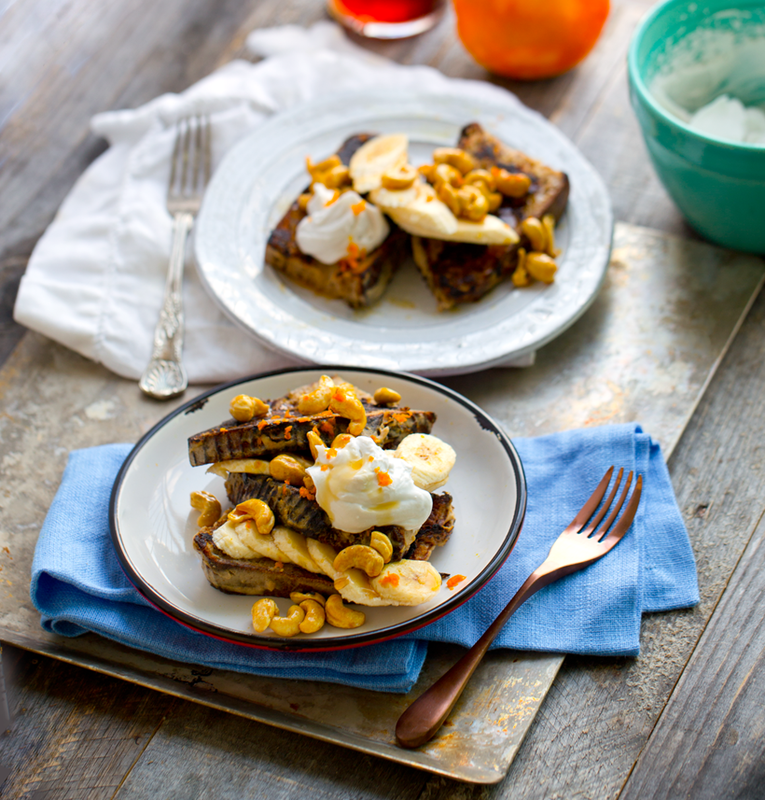 Spoon the freshly whipped coconut cream on top of the french toast. Serve! But wait, IS this a healthy breakfast though?? Ha! 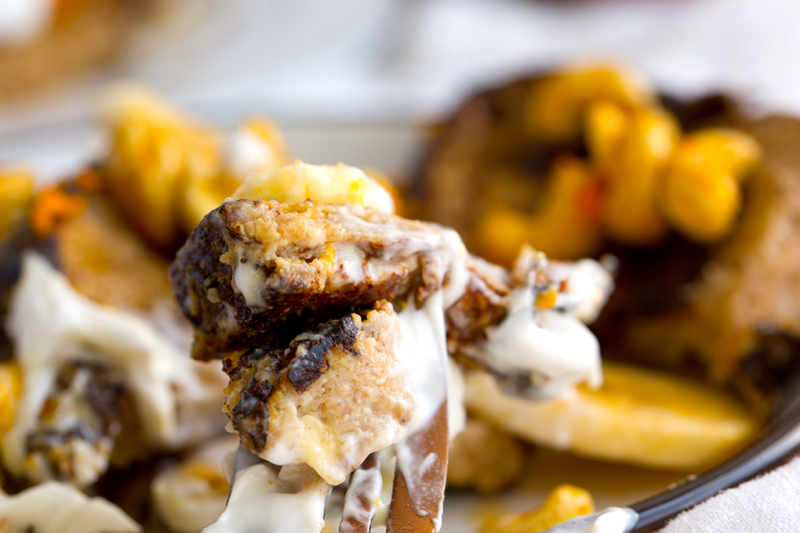 I just had to put "healthy" in my blog title and cookbook, right? I guess I have a less strict view of what "healthy" means. Healthy to me isn't perfection. The truth is, sometimes our own personal happy foods, whether they are "healthy" or not can be what your body and soul needs! And for me, a big plate of french toast with fluffy whip on top reminds me of being a kid and eating brunch out with my family. And just being happy. So for me, it is a "happy food." Not all my "happy foods" are indulgent. Peaches and sweet potatoes and matcha green tea are also happy foods for me. Carrot cake and banana splits and chocolate chip cookies, also happy foods. Troubleshooting: What if some of your "happy foods" are not vegan?? I think for many veg-curious people, that is where they get tripped up when committing 100% to a plant-based diet. Our emotions are SO closely tied to the foods we eat. So I basically say, you do YOU. I have found that over time, as you eat more plants and discover MORE "happy foods" that are vegan, you will crave those non-vegan "happy foods" less and less. That is what happened for me anyways. One of my big time "happy foods" was always frozen yogurt. And 17 years ago there was no such thing as vegan fro-yo. So I went veganish, and kept froyo in my diet. And as years passed, I discovered new vegan-friendly "happy foods" and I eventually lost interest in dairy and my precious frozen yogurt. And of course years later, today, there are so many options for vegan frozen yogurt here in LA! Healthy Eating. In regards to all the clean-eating "food noise" online these days, I really try to stay positive and less critical. When I hear people saying things like "no sugar, no caffeine, no gluten," I tend to tune them out. I am really proud of eating a plant-based diet that includes as many whole foods as possible, but doesn't deprive myself of treats. I mean, have you seen the amazing vegan ice creams on the market?? Bring on the sugar! Just don't overdo it. Your body will tell you that! Eat an entire pint of coconut milk ice cream and I promise you, you will not feel so great the next day. Eating is a learning process, like anything else in life. And leaning towards a more plant-based diet is also a learning process. And hey, look at you! Just by browsing recipes online, here and there, YOU are already WAY ahead of the game on arriving at a physically and spiritually healthy and happy dietary place in your life. Obsessing over anything devours our time and energy, time and energy that should be going towards finding joy and just living your life. But wait!!.. Ok skeptics, I guess some people could argue that veganism is a form of restriction. But the funny part is that, I feel the complete opposite. For me, I find veganism very freeing. Not vegan? I don't think every person needs to be a full force vegan to make a difference in the world and in their self. You will feel what is right for you. And that may change over time. But I do think that leaning towards eating more plants and less animal products is something that every human can benefit from - both physically and spiritually. Every little bit helps this planet too! Please never feel discouraged from embracing "vegan" even though you are not a full force "vegan."